Pesto is something that we usually reserve for summer time when the fresh basil is abundant. But as the rain, clouds and overall blah of Seattle fall/winter sets in, I was searching for a little bit of that a summer flavor. That is when I decided to make this this Sausage Pesto Pizza. 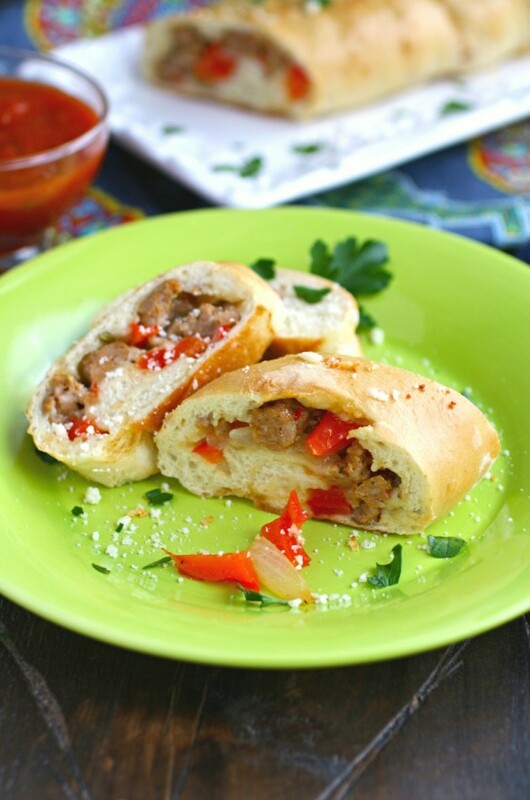 Crunchy, chewy crust is topped with homemade pizza sauce, diced mozzarella, Italian sausage and drizzles of pesto. It was the perfect way to brighten up pizza friday. 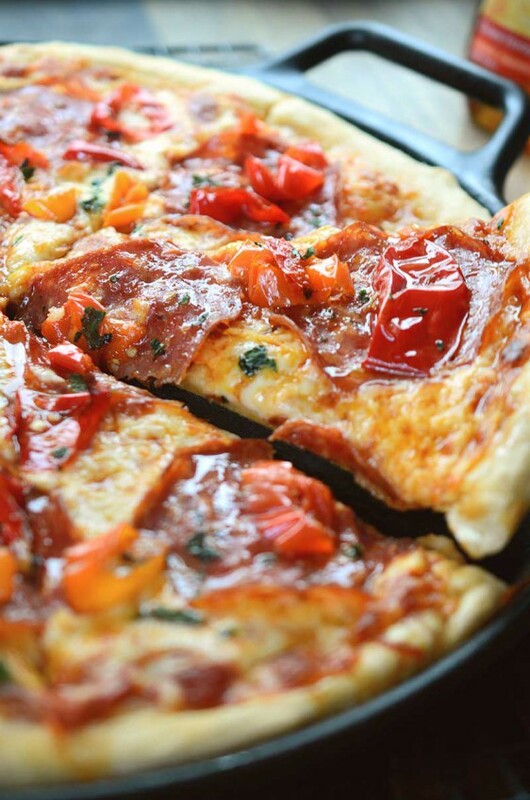 It’s been a long time since I’ve shared a pizza friday recipe. Not because we haven’t been eating pizza, it is after all, pretty much a weekly occurrence in our house. It’s just that the boys, well, they love pepperoni. Like LOVE it. Like I’m pretty sure that the word pizza = pepperoni in their eyes. 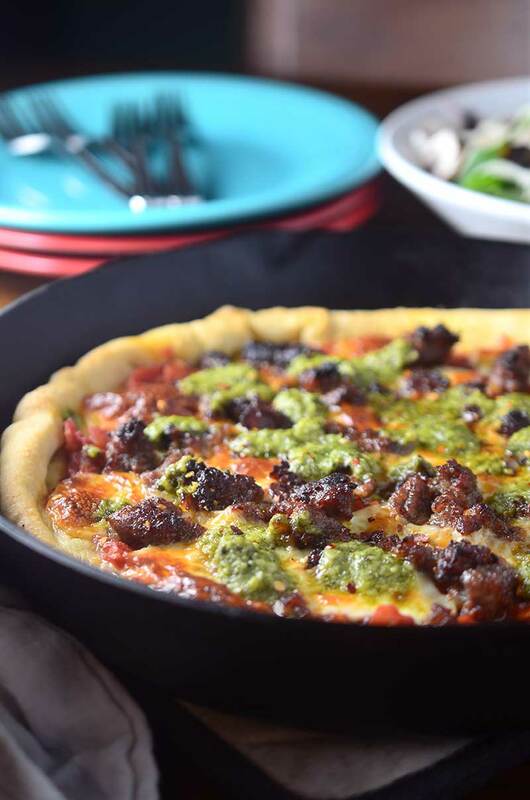 But sometimes mama needs to change things up which is why I made this Sausage Pesto Pizza. The boys still got pepperoni because it was pizza friday and I didn’t want to deal with the complete and total breakdown because the pizza had something green on it. Parents of toddlers you know what I mean right? Toddler meltdowns can be EPIC. Speaking of the green stuff. As much as I like making my own pesto, sometimes you just need a shortcut in the kitchen and buying store-bought pesto is just the way to go. I bought mine at Costco, it was a pretty good deal. I did make my own pizza sauce though. It’s one I’ve been making for a while now. All you need is diced tomatoes, garlic, olive oil, salt and crushed red pepper. Bring to a boil and then let it simmer down for about 20 minutes while you’re getting the rest of the pizza ready to go. It’s so simple and that’s what makes it my favorite. A couple other things about this pizza. Instead of shredded mozzarella, I decided to dice it up and scatter it around the pizza. I like to do it that way because it lets a little bit of the sauce pop through here and there. Second, I cooked this pizza in my cast iron skillet. That is by far my favorite way to cook my pizza. It makes for the perfect crust. Crisp on the bottom, yet still chewy. 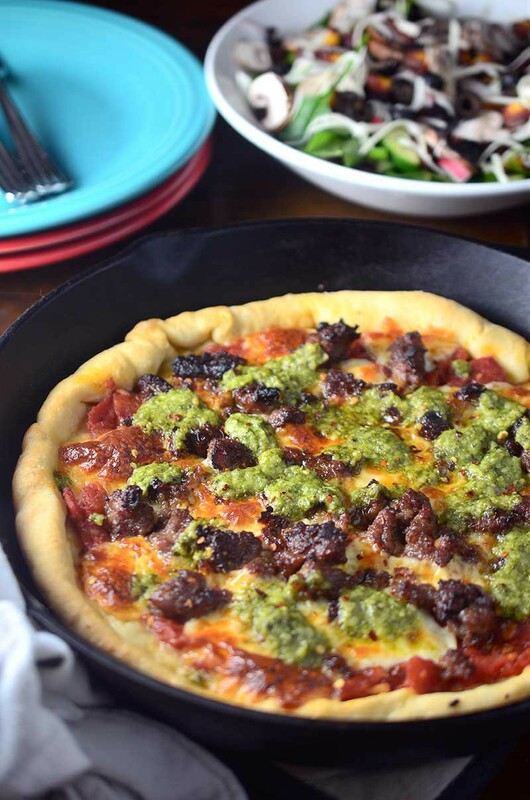 If you haven’t made a pizza in a cast iron skillet yet, let this Sausage Pesto Pizza be your first! Combine tomatoes, olive oil, garlic, salt and crushed red pepper in a small sauce pan. Use hands to gently crush tomatoes. Bring to boil. Reduce heat and let simmer for 20 minutes. While sauce is simmering, roll out pizza dough. Cook italian sausage in a 12 inch cast iron skillet over medium heat. Drain to remove any grease. 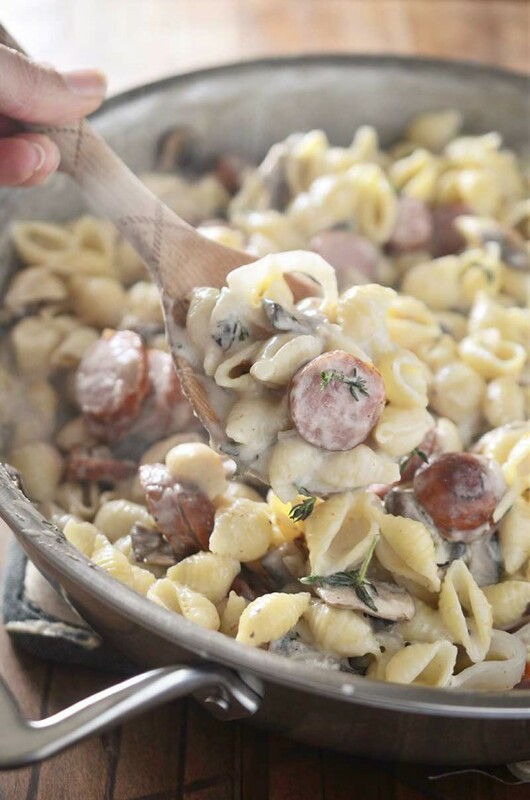 Place pizza dough in the same skillet that you cooked the sausage in. Press into the pan and slightly up the sides. Turn pan to medium heat. Cook for 5 minutes. Spread sauce over the top. Top with diced mozzarella and crumbled Italian sausage. 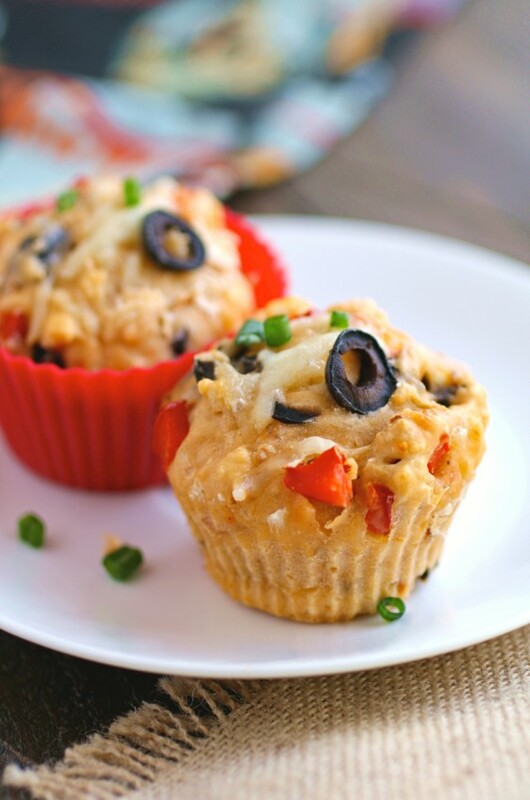 Bake in preheated oven for 12 - 15 minutes or until crust is browned and the cheese is bubbly. 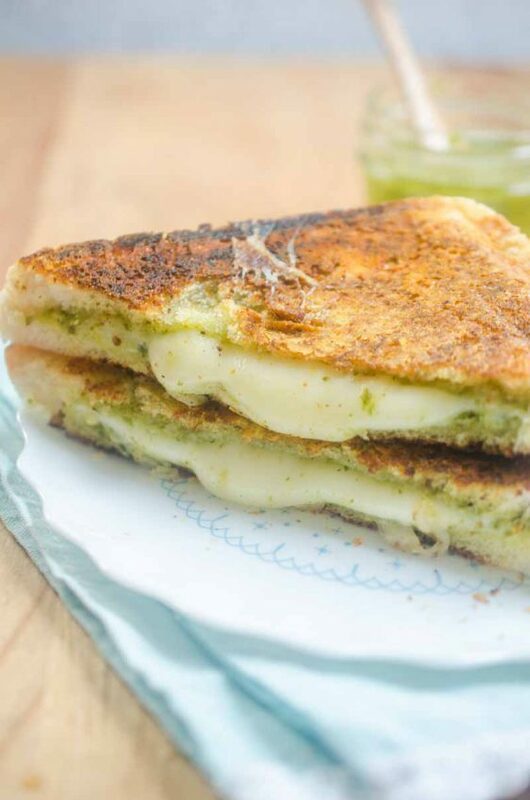 Remove from oven, drizzle with pesto. Slice and serve. This sounds like a perfect pizza for my husband! He loves sausage in Italian dishes! Oh man this pizza is calling my name! I love the addition of pesto. This looks so flavorful and comforting! 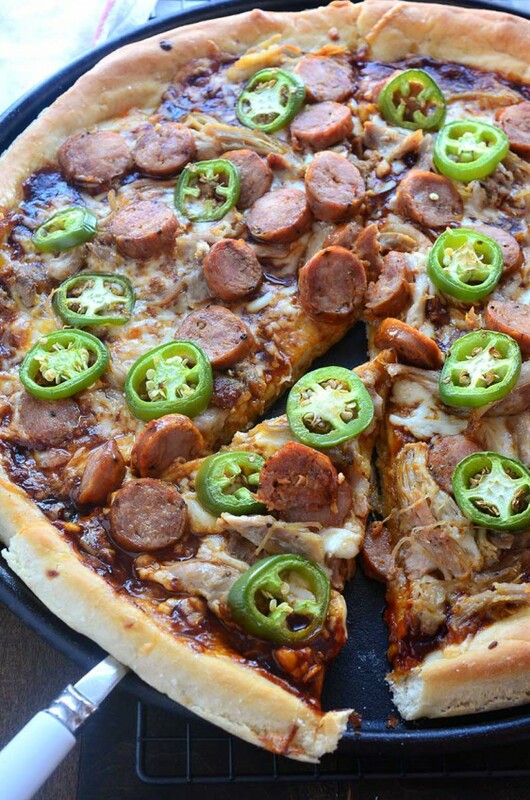 I love sausages and I love Pesto so this pizza is right up my alley! Pinned so I can share this deliciousness with my family soon!